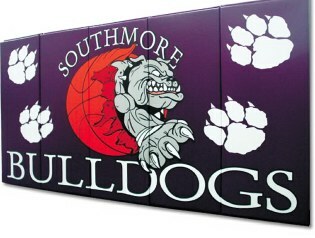 Wall Pads w/Graphics - 1-3/8"
Show Your Opponents That They Are In Your House! 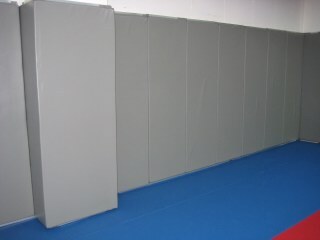 Wall pads are used primarily behind basketball goals to absorb impact and reduce injuries. Constructed of 1/2" Novaply wood backing with your choice of either Crosslink Polyethylene foam, 100 ILD High Density Polyurethane or combine both for a dual density pad. Pads are covered in 18 oz. vinyl and have a 1" lip at the top and bottom for attachment to the wall. Corner round molding or aluminum channel (not included) may be used to cover bolt heads after installation. Installation hardware is not included. Special, durable inks are used that produce extreme and intense, life size outdoor quality images. The vinyl is protected with a liquid lamination process to provide added durability and prevent fading. All you need to send us is a (copyright free) digital image on CD, or original artwork. For an additional charge, our designers will create or enhance your existing artwork. All images, including any additional charges, will be sent to you for approval prior to printing on the product. If your gymnasium is also used as an auditorium or theater, you need our stage pads to reduce the chance of injury to your athletes. Our stage pads are designed to conform to your specific application. The inboard side of the fold is beveled so the edge of the stage is fully padded. 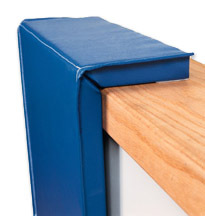 Fastener strips are included and prevent the pad from shifting, sliding or detaching while in use. Manufactured using 1–3/8" cross-linked polyetheylene covered in 18 oz. vinyl. Available in Black, Columbia Blue, Dark Green, Grey, Kelly Green, Maroon, Navy Blue, Orange, Purple, Red, Royal Blue, Tan, White or Yellow. Please specify color. Cover straight edges. Allows padding on straight stage front.